When you are considering making a potentially big decision like a large purchase, or making some other business commitment, it is wise to do your homework on the company in question. The website's description is, "the Internet's learning community and a pioneer in e-commerce web-based training for business and the public since 1999." What do you see on the website? Ok, so there are links to their social media accounts on the left, a list of "Available Courses" in the middle, and a login box, clock and calendar on the right side (I've no idea what purpose the clock and calendar serve). Also, at the top, above the main banner is a little strip which appears to contain various awards presumably earned by the site or the business. As to what these awards are, I have no clue, and they do not link to anything, which is a bit odd. 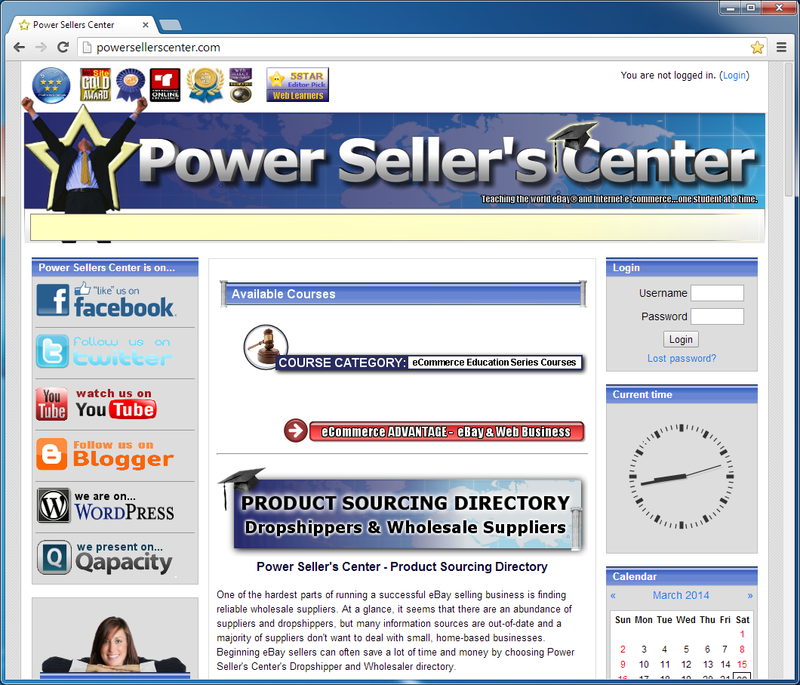 Now, let's take a look at Power Seller's Center's social media sites. The Facebook link takes us to their BBB (Better Business Bureau) review. Quite strange. How about the Twitter account (@powersellerscenter link, right)? Nope. Again, it's a link to their BBB review. Blogger blog? Oh, strange. It's a Tumblr blog! Oh, but they also have a Wordpress blog. But.. it's also linked to that BBB review. Qapacity? Yeah, same BBB review. What I see here is simply not common. Normally if there's a link to a Facebook account, it's a Facebook account! And so on with the other social media links. Also, you might notice that there is very little in the way of company information or company contact information. You have to suspect something is fishy when a company seems not to want to be contacted. Something else I've spotted that's unusual. Take a look at those brand names. I don't know the purpose, aside from implying that the site is somehow associated with these brands, or perhaps the implication that you will be selling these brands when you complete the courses offered. Hover over these to see what sites are linked (or just click on them) and you will find that many of them take you to forum posts, presumably from people that have had success with the program. 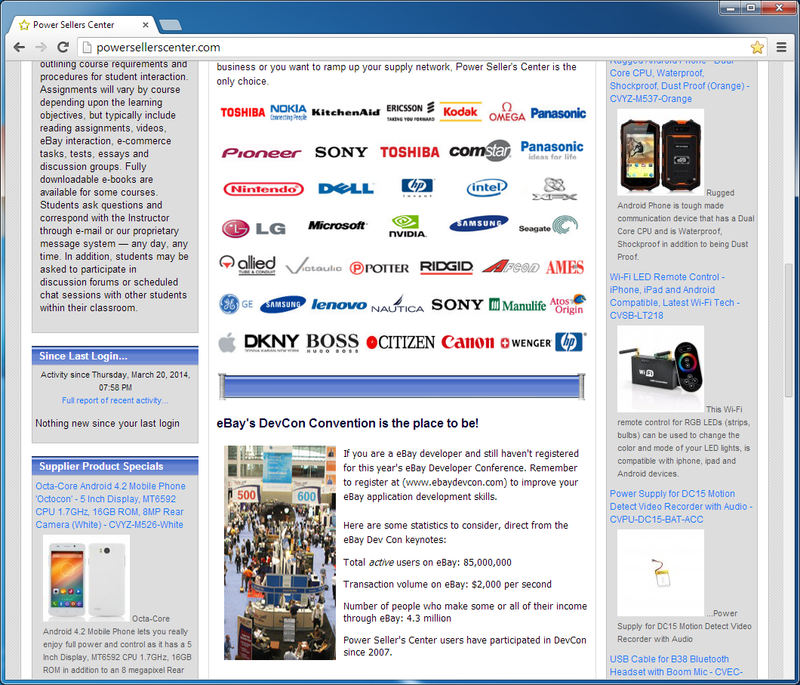 However, the forums to which they've been posted are completely unrelated to Power Seller's Center. The first line of brands, from Toshiba to Panasonic, link you to their "Website User Agreement", as does the last line, from Apple to HP. Hello everyone, I'm a Power Sellers Center student and I just joined this forum. It was recommended that I do so by another student. I have seen a lot of interesting stuff here. I hope to be able to participate in discussions and offer my input as well! The third line links to a forum at DigitalCameraReview.com, but the post has been deleted. The fourth line links to a forum at AllDeaf.com and mentions, "I'm a deaf Power Sellers Center student and I just joined this forum. It was recommended that I do so by another student who is also deaf..."
The fifth line links you to the same BBB review as mentioned above. And quite interestingly, the sixth line links you to bluelight.ru which is a forum for discussing drugs, and includes a similar post as the others. The fact is, legitimate businesses generally will not advertise using forum spam. Now, let's take a look at that BBB review that the Power Seller's Center links to so many times on their home page. According to the BBB review, there were 0 complaints closed with the BBB in last 3 years and 0 closed in last 12 months. Good, right? Their BBB file was opened on 08/11/2011 and their business was started: 09/21/2001. I'm not entirely sure what that means for the 10 years in between. Note that "BBB Business Reviews may not be reproduced for sales or promotional purposes." But it doesn't say you can't link to it five times from your home page! Right? The BBB review also mentions PSC's alternate business names: Power Seller Collegetech, Example Technologies, LLC, as well as alternate web addresses: www.powersellercollege.com. PSC's address appears on the BBB review. Look at it, and use the map (or Google maps) and you'll find that the company address is a mailbox at a UPS store! It is always a good idea to Google any company with which you are considering doing business. If you Google Power Seller's Center or Power Seller College, you will see some interesting things, including more forum spam posts similar to the ones outlined above, as well as some very negative reviews, and a handful of dubious good reviews (often from new forum users who only post once or twice, as you will often see in spam advertising). And finally, if you search for the owners of the domains powersellerscenter.com or powersellercollege.com, by doing a WHOIS search, you will find that the owners have used a proxy service so that they cannot be contacted. So let's hear your comments. Have you had any experience with Power Seller's Center fka Power Seller College? What do you think? Is Power Seller's Center a legitimate business, merely a business of questionable business practices, or a downright ripoff? Welcome to my new blog Scams and Ripoffs! These days, scams are everywhere: email, banner ads, phone calls, and so on. You really have to do a bit of research to know which opportunities are really just opportunities for someone else to rip you off! Some scams are easy to spot. Meanwhile, others may appear to be legitimate, but are still just meant to take advantage of the average consumer. We will be looking at different companies, opportunities, and too-good-to-be-true claims and looking closely at them to help determine if they are scams, questionable businesses, or real opportunities.